NEWPORT, R.I. — No one knows for sure who built a 28-foot tower in the heart of this history-steeped city; no one knows when, and no one knows why. But nearly everyone knows the legends: Its eight pillars and fieldstone cylinder are the work of far-roaming Vikings, or Chinese explorers, or Portuguese noblemen, or Knights Templar from medieval Scotland. Or, more widely accepted, the tower is a 17th-century windmill put up by Colonial Governor Benedict Arnold, great-grandfather of the infamous Revolutionary War traitor. According to a Danish researcher, the answer seems to be none of the above. Instead, Jorgen Siemonsen told the Newport Historical Society last week, the tower appears to have long-veiled Masonic roots that evoke a Dan Brown-style mystery more than rampaging Norsemen on a trans-Atlantic road trip. And not by Vikings, Siemonsen said, even though the pull of that possibility has lingered for generations in a city where the high school nickname is the Vikings, the Hotel Viking is a landmark, and Viking Cleaners will launder your shirts and blouses. Circumstantial evidence, Siemonsen said, points toward the fledgling Freemason movement in Rhode Island and a well-connected, English-trained architect who found work among the rich and famous of Colonial Newport. That architect, Peter Harrison, laid out an octagon summer house in the mid-1700s for Abraham Redwood, a wealthy Newport merchant, Siemonsen said. That geometric form, closely associated with the Freemasons, is mimicked in the eight pillars of the tower, a little more than a block away, that Siemonsen speculated Harrison also designed. The tower grounds, according to the Dane, could have been a “Masonic garden’’ where the fraternity conducted its rituals. Carbon-14 testing of the tower’s mortar points to 1740 to 1810 as the most likely period of construction, Siemonsen said. That result, coupled with Harrison’s exposure to octagon design in England and the founding of a Masonic lodge in Newport in 1749, help Siemonsen buoy his theory. If the tower had been built earlier, Siemonsen said, “somebody would have left something in the ground.’’ Excavations at the site have found no artifacts that predate Colonial times. “There is an old Danish saying: The truth is in the earth. The soil doesn’t lie,’’ Siemonsen said. 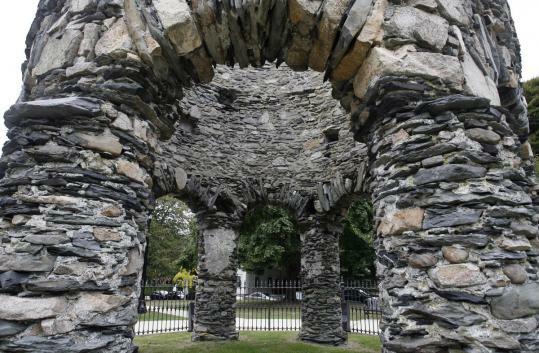 John Weintraub, a Newport resident who was sitting on a bench reading a book in the shadow of the tower, guessed that Native Americans were the builders. Siemonsen, who is chairman of a Danish committee that has spent $600,000 studying Norse links with North America, said he has been fascinated by the tower since 1963, when he first saw it as a Yale University freshman. In Newport, the Viking mystique gained adherents beginning in the late 1830s, when a Danish archeologist advanced a theory that the Dighton Rock, which had long baffled scholars, bore the name of a Norse adventurer carved in runic letters. Siemonsen, however, has moved past the Viking link. The carbon testing does not support the myth; the site has not yielded any Norse artifacts; and the notion seems far more romantic than realistic. Jody Sullivan, executive director of the Newport County Chamber of Commerce, counts herself as a Viking skeptic. The Historical Society, meeting Thursday in a chamber that once housed the Colonial and state governments, greeted Siemonsen’s theory with applause. But letting go of a legend, even an outlandish one, will be hard. But for Michael Remillard, an interested observer from Bellingham, Mass., there is no mystery. As he left Siemonsen’s presentation, a file about the Newport Tower tucked under his arm, Remillard said emphatically that he had not changed his mind. “I believe that it goes back to the Knights Templar,’’ he said. To underscore his point, Remillard even offered a date: Nov. 29, 1116.